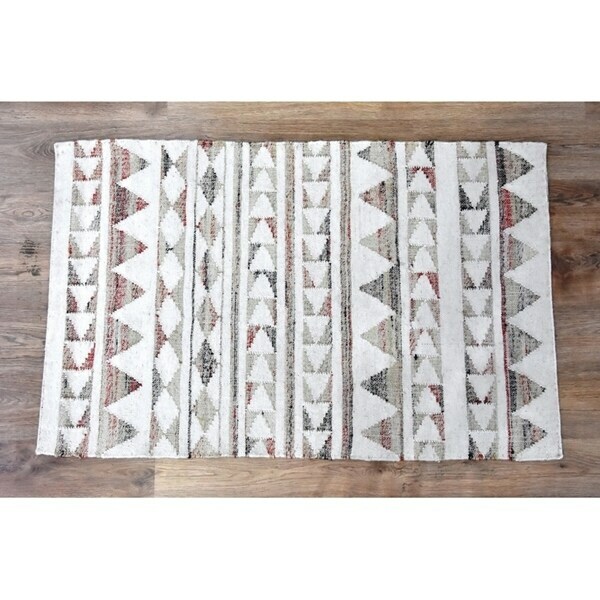 This lovely handwoven wool and jute rug adds contemporary elegance to your home space. Hand-spun jute fibers are naturally silky, highly durable and are a fully renewable resource. Inspired by traditional kilim patterns it has a vintage, eclectic look that can easily be mixed and matched to your taste. Crafted with sustainably harvested jute. Every piece is one of a kind. Product Care & Assembly Shedding of looses fibers is normal and is natural result of the process used to create hand woven wool rugs. Do not pull loose ends. Clip them with scissors to remove. To prevent dust and crumbs from settling into your rug, vacuum regularly and/or shake. Professional rug cleaning recommended. Blot spills immediately with a clean cloth. Pile Height: 0.25 - 0.5 inch Tip: We recommend the use of a non-skid pad to keep the rug in place on smooth surfaces.